Seriously, I can't help myself. Two of my favorite colors are Shiny and Sparkly and I'm automatically drawn in if those words are in my view, whether it be real life or my computer screen. 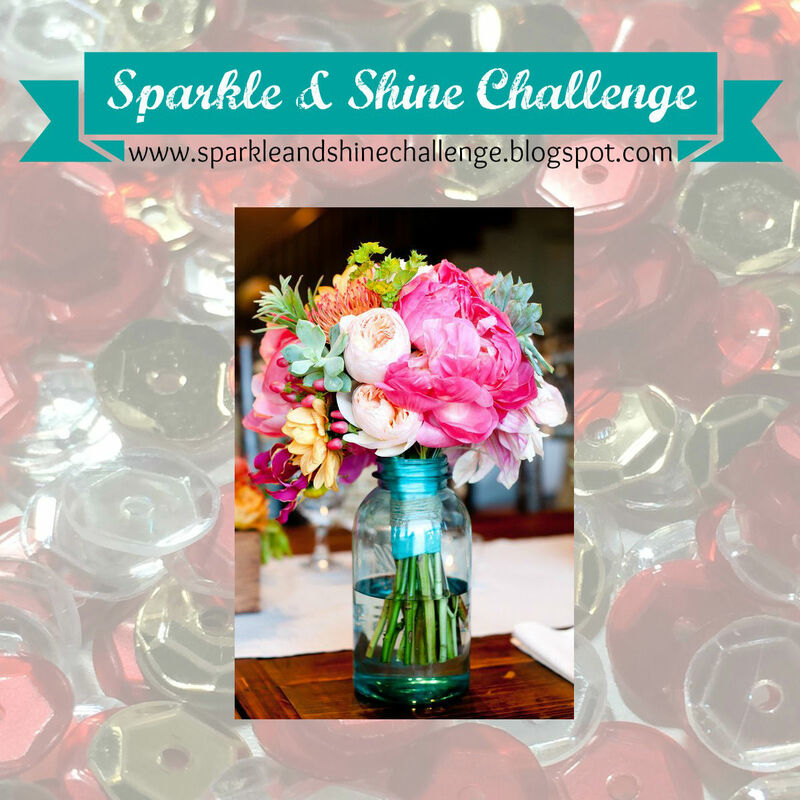 So naturally when I found the Sparkle & Shine Challenge Blog, I had to participate. 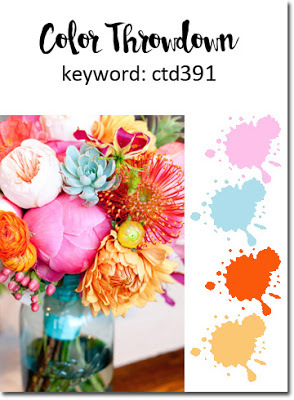 I was already aware of the Color Throwdown Challenge and it also has a beautiful inspiration image this week. I'm pretty certain that the images are different views of the same flowers. There's just too many of the same exact things in the image like the succulents, how the stems are wrapped, and even the container is identical. The image on the left is our inspiration photo for this week and I tried to incorporate several of the colors into the design of my card. I got a card this week from my friend, Joyce, and I thought her lovely design so pretty that she was also a part of my design inspiration. You can see her card here. I started by doing some ink blending on a piece of watercolor card stock using Tumbled Glass Distress Ink and a Ranger Mini Ink Blending Tool. I intentionally left it slightly splotchy to mimic the sky outside my studio window but still darker around the outer edge all the way around. This gives you a nicely "lit" area in your card's "sky". Once I had that inked up, I gave it a slight mist with some Tsukineko Sheer Shimmer Spritz and set it aside to dry. I took another piece of watercolor paper and inked blended it very randomly as well using Papertrey Ink's New Leaf and Lucky Clover Distress Ink to get a blend of the two inks. It didn't need to be well blended as I was going for a more natural and organic feel of the greenery with light and shadow. After letting it dry for a few minutes, I cut the Friendship Jar Flowers foliage from it. Next I used the Friendship Jar Flowers Stamp Set to stamp the leafy greenery in New Leaf Ink on the background of the blue "sky" panel. Since the stamp was previously unused, I stamped it on a piece of scrap paper first using Versamark and then without cleaning it inked it up. The ink can bead up on the surface of the photopolymer when it's brand new but if you stamp off once with Versamark it helps the ink to stick to it. Since I am trying to make it appear that there's some background foliage, I laid my die cut leaves differently than the stamped image. In this way, I hope it gives the impression of shadows in the background. I used two of the smallest butterflies from the Color Pop Butterflies Kit and drew in the stitched lines with a White Signo Uniball Pen for the butterfly's paths through the sky then adhered them with Ranger Multi Medium Matte. I had some of these small paper flowers from long ago and I thought they'd be perfect for this card. I attached the buttons to them with Multi Medium Matte as well. The sentiment is part of the Color Pop Butterflies Kit as is the little banner. I stacked 4 layers of the sentiment, gluing them one on top of the other, and then did the bottom layer offset in Navy Blue cardstock to act as a kind of shadow and help the white sentiment to stand out from the light colored sky. This is such a cheerful card for someone who is retiring after 30+ years of teaching. Thanks so much for stopping by my blog today and I hope you enjoyed this card. The end of the week is nearly here so enjoy your weekend! So pretty! Love the look of the layered leaves--it does have a shadowed effect. Thanks for joining us for this week's Color Throwdown! This is so pretty! I love the button centers, and those 2 butterflies are the perfect touch!